MOUNT GILEAD — Morrow County helped the people of Houston in the aftermath of Hurricane Harvey. Local resident Jim Bartlett collected clothing last Wednesday and Thursday morning at a truck parked at the Mount Gilead Save-A-Lot. The truck left Thursday afternoon taking items to the Fern Trucking Company’s semi in Columbus to be hauled to Houston. Bartlett’s sister and her family live in the affected region. Some residents added a personal touch. “Many had written little notes on the bag labels. Things like ‘Sent with love from Edison’ and ‘Our prayers are with you.’ The donations filled most of the truck. And since some people brought cash over we used that to buy water to fill the back end to the brim,” Bartlett said. The truck made its first run to Columbus. Bartlett knew that 24 hours wasn’t much time for folks to get donations together. Now that the initial push to get dry clothes and water to Texans is past, Bartlett’s truck is open to receive more towels, sheets, pillows, diapers, water and clothes. Several local churches in the Inter-Church Council assisted Bartlett’s efforts. Those include Bryn Zion, First Baptist, First Presbyterian, New Life Assembly of God and Trinity United Methodist. “We are only helping with this. It is Jim Bartlett’s idea,” said Rev. Deborah Bowsher of First Presbyterian Church in Mount Gilead. Harvey slammed into Texas on Aug. 25 as a Category 4 hurricane, but brought the worst flooding to Houston and other areas as a tropical storm. The rain totaled nearly 52 inches in some spots, and the storm is blamed for at least 44 deaths. The local office of the American Red Cross is also helping. “One of the best things about living in Morrow County is how generous people are and how willing they are to help. With the crisis down south you can imagine how many phone calls and visits we are getting asking us what could be done to help out,” said Jeanine Girard, volunteer administrative coordinator. Here are ways residents can help those in the Gulf region. To find the drives in your area go to http://www.redcross.org/give-blood or call 1-800-RED-CROSS. “Not everyone can donate monies and we certainly understand that. If you would like hold a car wash, a bake sale, garage sale any type of event like that and donate the proceeds,” Girard said. If you wish to donate money, go to http://www.redcross.org/ You may also call 1-800-RED-CROSS. The Red Cross office in Mount Gilead is open Monday-Fridays 10 a.m.-4 p.m. and the phone number is 419-946-2811. Jim Bartlett with a truck load of water and other items for victims of Hurricane Harvey. 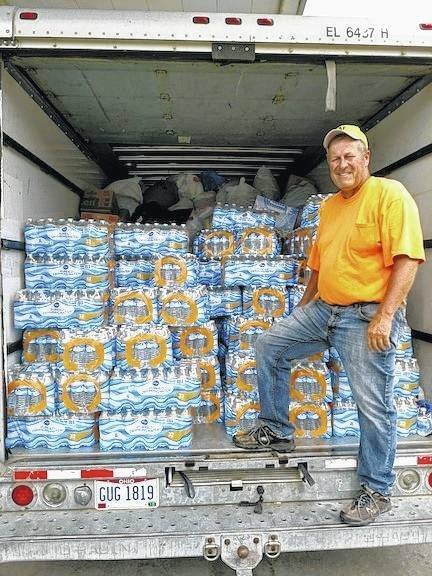 https://www.morrowcountysentinel.com/wp-content/uploads/sites/29/2017/09/web1_Jim-Bartlett.jpgJim Bartlett with a truck load of water and other items for victims of Hurricane Harvey.